It’s that time of year when everyone seems to be out in the front yard sprucing up their landscaping, getting their gardens started, and enjoying this gorgeous weather. I, too, have jumped on board and finally got my smidge of a garden going. Now I know I’m late on getting everything planted this year but our Plan A of building raised beds fell through since Josh doesn’t have the time right now. I mean isn’t it normal for people to be at the office ’til 1:30am then come home, ‘sleep,’ wake up , and do it all over again? No? Shootfire. It was sweet of him, however, being an engineer, that he designed his own set of plans complete with engineering ruler and all. Gotta love those mathematicians who break out the graph paper and slide rulers for small projects! Please ignore the bad quality as it is a cell phone picture. Any who, back to Plan B which entails using the pots we had from the previous years, borrowing a few, and purchasing a big hunk-a pot to do some companion growing in. I was excited to get a bunch of veggies going this year on my journey to be self-sufficient but alas that dream will have to wait another year. Le sigh. That’s ok though, because ever since I got started with the growing.my.own.herbs.while.living.in.an.apartment bug, I am excited at the chance to grow bigger and better the following year. Side note: You’ll never guess where my inspiration for growing my own herbs came from. For three years, I worked at Barney & Friends as a shopper and would have to frequent plant nurseries and would occasionally shop for myself…you know, like getting planters for my balcony. 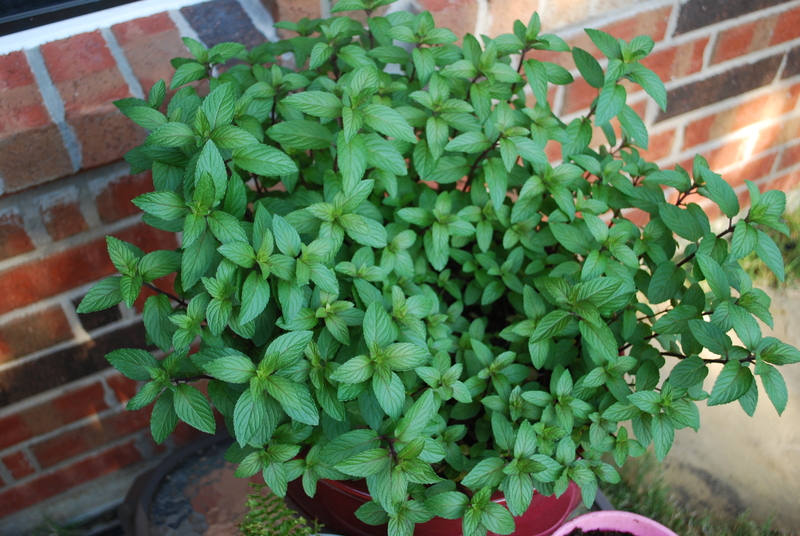 Thus began my love affair of growing my own herbs, then drying them out to use as spices (it saves a bundle)! Without further ado, let me introduce you to the family (pictured in April). They might not be the prettiest but gosh darnit they’re mine. From left to right (back row): lettuce, rosemary, sweet bell pepper and eggplant, tomato, and basil. (front row): marigold, flowering cactus, and chives. UPDATE: Here’s the family in October, and I have to say I’m quite impressed! Hopefully next year we can yield more produce. 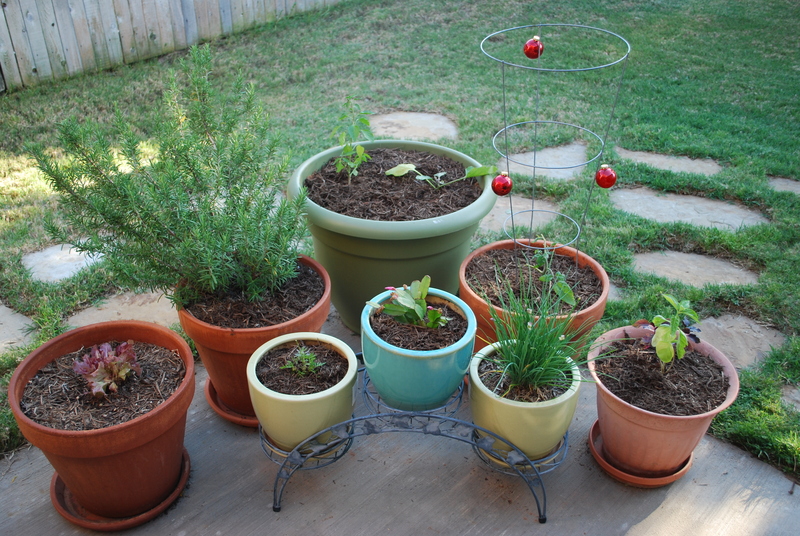 From left to right (back row): milkweed, rosemary, sweet bell pepper and eggplant, tomato, and basil. (front row): marigold, pineapple, and chives. If you end up getting late tomatoes that don’t ripen, see this post to find out what to do. I’ve also got some crazy mint going on that may have spread to the grass and gets watered since it’s under the spicket. Oops, my bad! Should I leave a note? Be careful when growing mint, that stuff is like a weed and will spread like nobody’s business, so keep it contained. My mint used to be of the chocolate and spearmint variety but they have since grown together to become one in holy matrimony. But the main point of this post was to talk about Tommy the Tomato plant. Yeah, I said it. I name most of my plants, vegetables, and herbs that I grow because they are living, breathing things, too (and it’s just plain fun). The funny thing is that my hubby will even call them by their name when he inquires after them…for some strange reason that man loves me despite my kookiness! I would now like to share with you the tips on growing tomatoes. I’m not an expert by any means but I’ve done it for the past two years, both successfully and unsuccessfully. Obviously you know climate has a big factor in how they turn out and our ridiculously hot summer what not a friend to Tommy last year. Let’s take it step by step shall we? *Oh no, I think I’ve just channeled New Kids on the Block. So sorry. 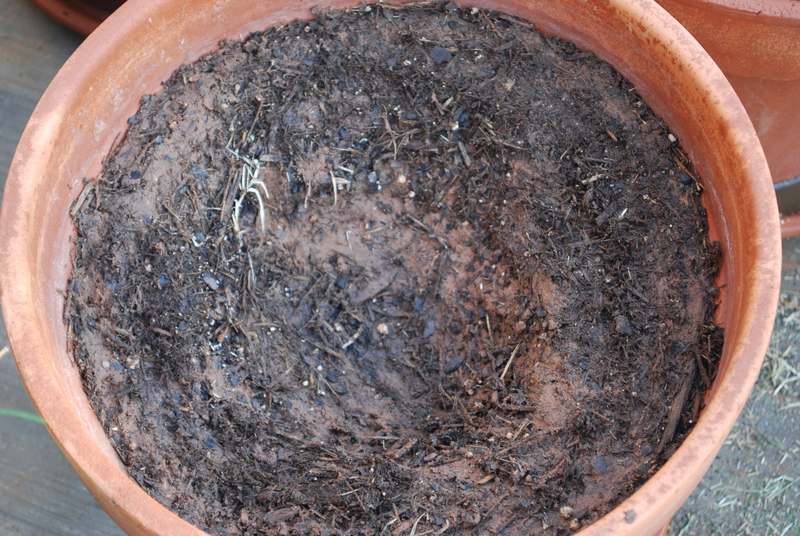 Step 1: Fill a pot combined with potting soil and no more than 50% compost (you can do your own compost bin). 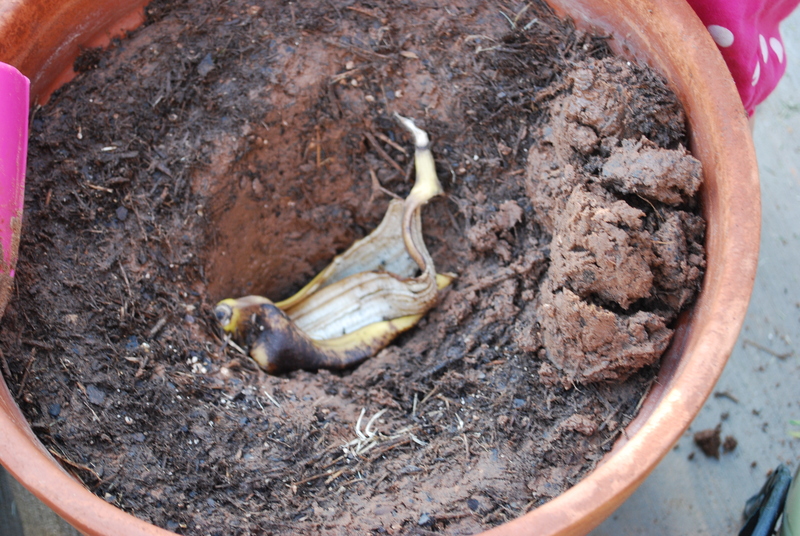 Step 2: Add a banana peel and cover with more soil. 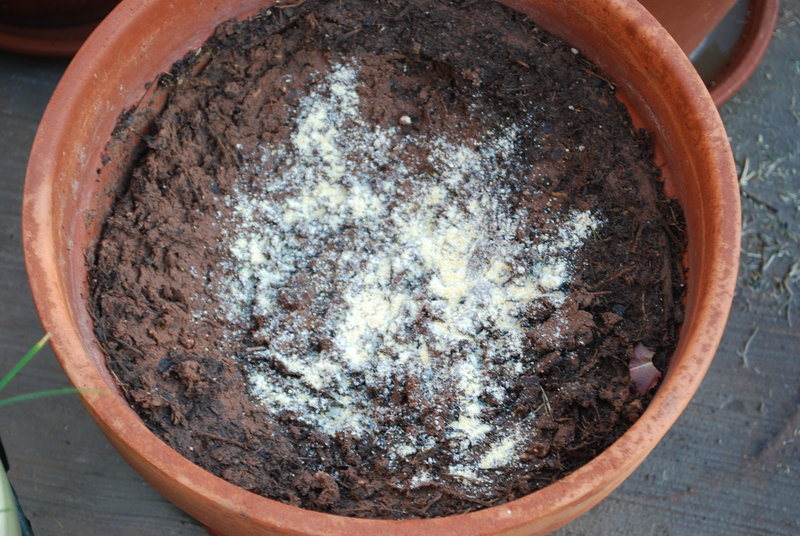 Step 3: Sprinkle some cornmeal (gluten-free or regular) on the soil and add the tomato plant. My MIL taught me that one, so this is the first year I’m giving it a go. 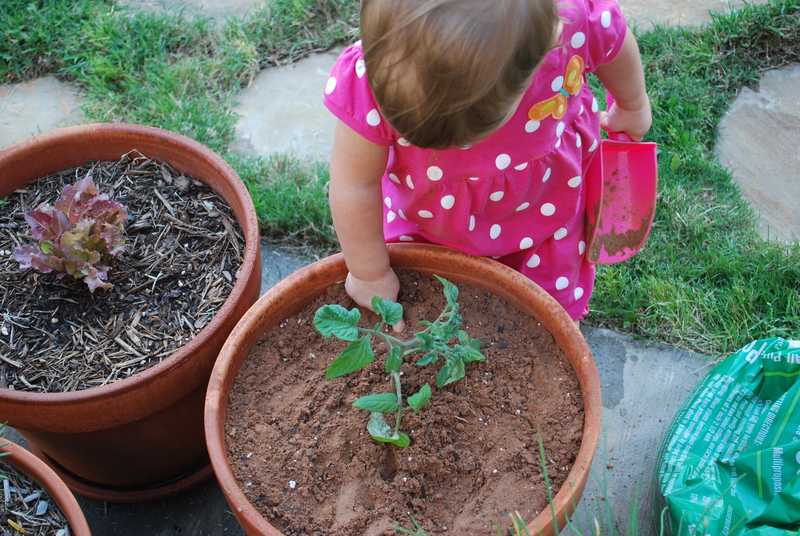 Step 4: Cover with remaining soil and add your tomato cage (a special helper is a plus). You may think it’s too early to add this but I just busted a black crow trying to eat Tommy’s leaves. Not cool; he’s just a lil guy. And in case you’re wondering what type of plant I got, it’s called an Heirloom. Basically they are non-hybrid tomatoes and are classified as “breed true” meaning they haven’t been altered by the almighty Monsanto. Just say NO to Roundup! A trick my hubby found, which does work, is to hang a few of those red Christmas ornaments on the cage so the birds think they are actual tomatoes. They will try to peck at them and when they realize they ain’t gettin’ a drink, they will move on and leave the real fruit behind. I know it doesn’t look the prettiest, though maybe a little Christmas festive, but you want to reap the benefits of your labor. Another trick I learned, or was forced into doing, was adding a pie pan to the cage to keep that cursed crow away from my eggplant, peppers, AND marigold now, too. That crow hasn’t seen the last of me! Oh, and one more tip is to ‘spank’ your tomato plant. 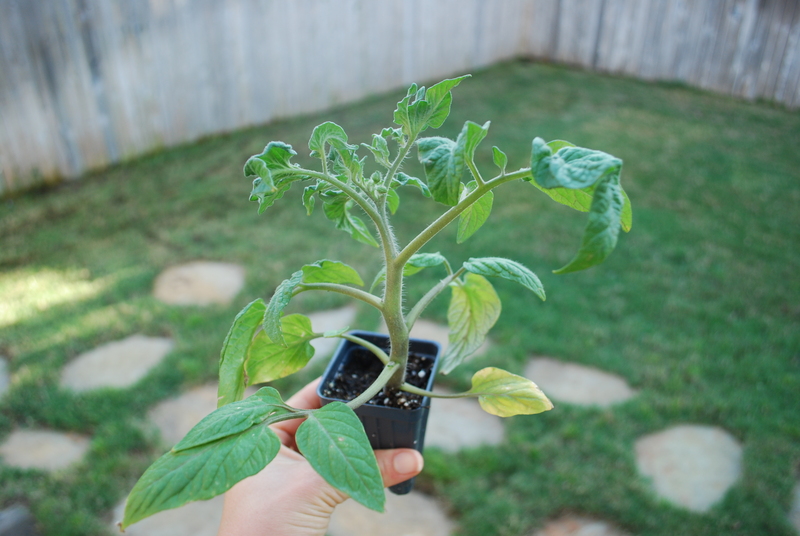 You read that right, spank your tomato plant with a rolled up newspaper, every few days to help it spread its seed once it blooms. Also, make sure you don’t water the leaves, just the soil. 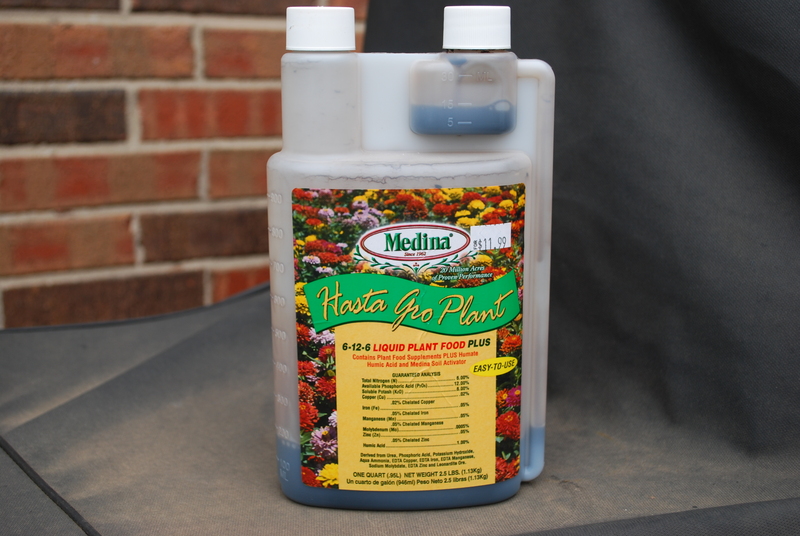 And for some added help, Josh found this plant food that I use on my flowers, herbs, and veggies. It’s called Hasta Gro Plant by Medina and he got it at Lowe’s. The instructions say to mix 1 oz. per gallon of water and apply with a sprinkling can. Thoroughly water the soil around the plant. Repeat every 3-4 weeks during growing season. Well there you have it. I swore I wouldn’t talk this much about how to plant a tomato plant but yet again nothing is quick and easy for me. And where did all the movie and song quotes come from? Did you catch them all? My hope is that you will get inspired to grow a garden, even if it’s small, so you too will have the satisfaction of running out to grab that special ingredient that you grew with your own two hands. Does anyone else have some garden action going on or do you aspire to rid yourself of your brown or black thumb? If you need help, talk to people at nurseries or search around online. There are tons of tips out there. I really had no clue what I was doing but I went ahead and jumped right in. Happy gardening! Jeff and I try every year to grow tomoto plants, but it has never worked out for us. 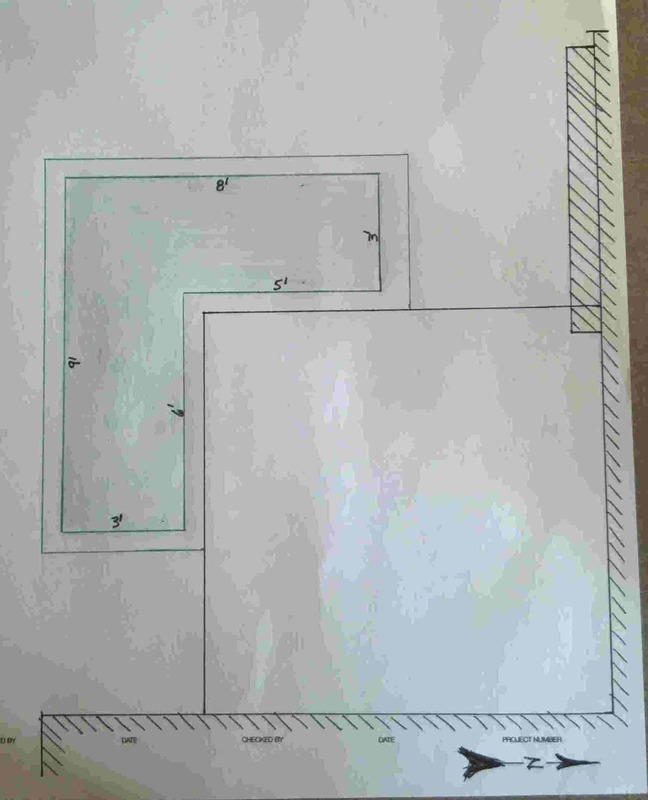 We might get one tomoto and then all we get is a nice big ant bed to deal with. I’m gonna see how this goes for you and maybe try again next year. It’s pretty late this year. i’ve tried planting them in pots and in the ground with no luck either way! Hmm that is strange…I’ll let you know how it goes. 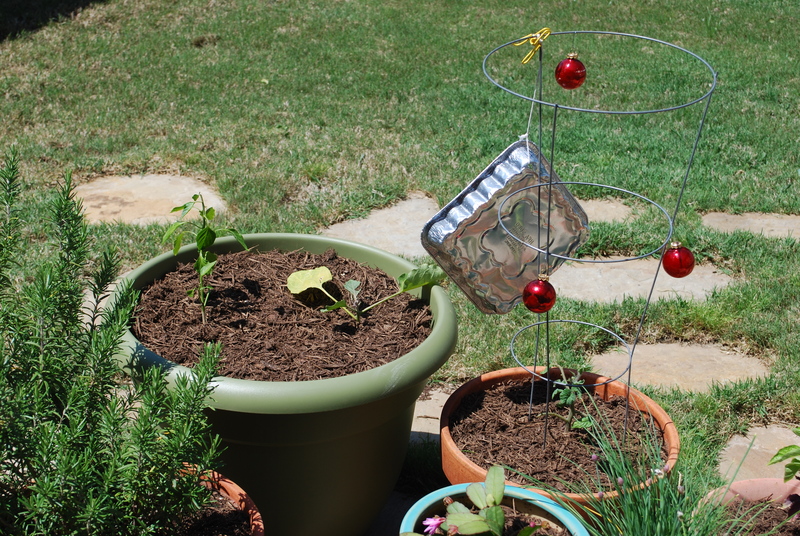 I wonder if you could use one of those topsy turvy planters and see if they work.